I am an engineer living in Houston, TX. I write flight software for a living, and in my free time I write software for fun. Yolo. The "big, dumb booster" concept was introduced in the 1960's by Bob Truax. “Make it big, make it simple, make it reusable” was his motto. Now that reusability is back in style, is it time to give the big dumb booster another look? Current launch vehicles are like high-performance race cars, but Bob's idea was to build a rocket that has more in common with an 18-wheeler. The big dumb booster concept does not place emphasis on minimum-mass, maximum efficiency designs, instead it seeks to minimize the total program cost of hauling mass to orbit. Bob's counterintuitive argument is that by spending more on fuel and materials, you can bring the net cost of launch down by reducing design, test, and manufacturing costs. Does the launch industry need the big dumb booster today? I read recently that "Past studies have predicted that launch demand would remain inelastic (i.e., not changing in response to lower prices) until prices fell enough to trigger a new source of demand." Sure it makes sense at an intuitive level that there will not be demand for more launches until there are cheaper launches, but it raises some really big questions as well. What is this mysterious new source of demand? How far does launch cost have to drop to trigger this demand? 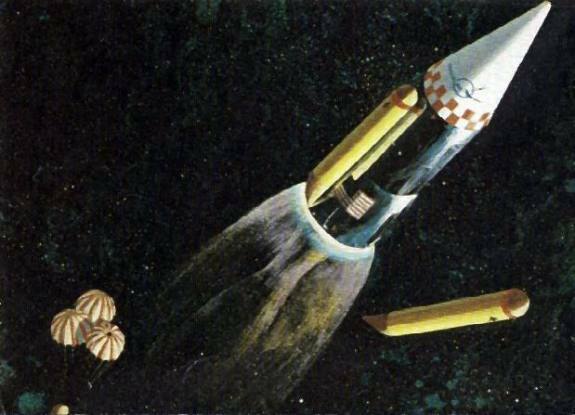 In this post we will look at some historical big dumb booster concepts, like Bob Truax's "Sea Dragon," and then we will examine what a modern big dumb booster might look like. Finally, we will attempt to identify potential new sources of demand, and reason whether a massive, cheap launcher would trigger that demand or if small, cheap launchers would be better. 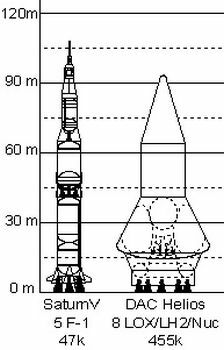 Here's a comparison of some vehicles, both big dumb boosters and not. Bob Truax's Sea Dragon was a design for a 150 m tall, 23 m diameter rocket, manufactured at ship yard, launched at sea, landed in the ocean without parachutes, and then re-used. It was big, sturdy, dumb as a rock, and never got off the drawing board. But it came close after Bob was able to test-launch the partially-submerged sounding rockets Sea Bee and Sea Horse. 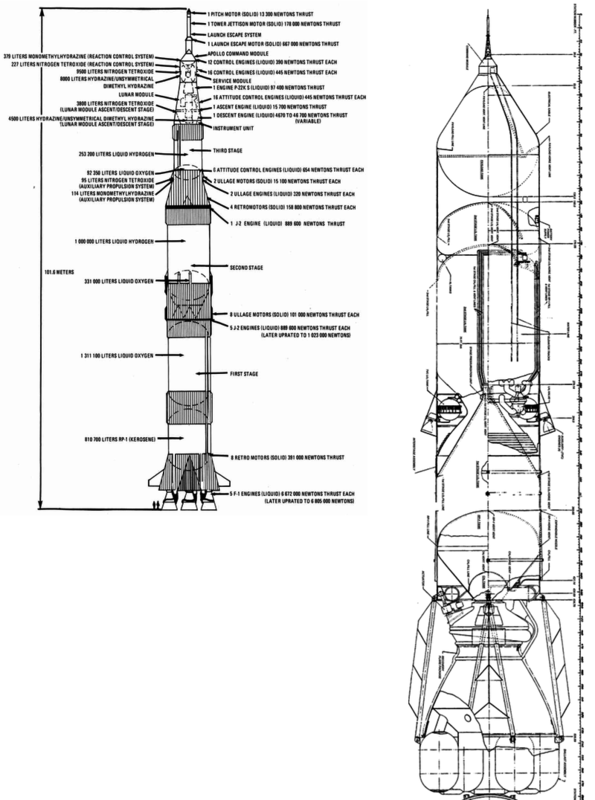 Sea Dragon is probably the best-studied design of all the launch vehicles on this page, and may have been the closest of the historical ultra heavy lift rockets to achieve funding. The top image in the section is from this curious droid youtube video which goes into great detail about Sea Dragon. Phil Bono's Reusable Orbital Module-Booster and Utility Shuttle (ROMBUS) looks the most like something out of Kerbal Space Program of all the launch vehicles presented in this post. That's because of the external tanks which are depleted and ejected one-by-one during flight. ROMBUS was designed to carry 450 Mg to LEO and cost about $5/kg during its operational life. You will notice that instead of a large conventional bell nozzle like most of the other concepts, there is a plug nozzle, and a very short plug nozzle to boot. That's because the actively cooled plug nozzle would also function as a re-entry heat shield. After re-entry, the rocket would use parachutes to slow its descent, but would land upright with a final landing burn to zero out the remaining velocity. Unlike the Sea Dragon, ROMBUS's ability to reach orbit depended on high-efficiency combustion and an unbelievably small structural mass. 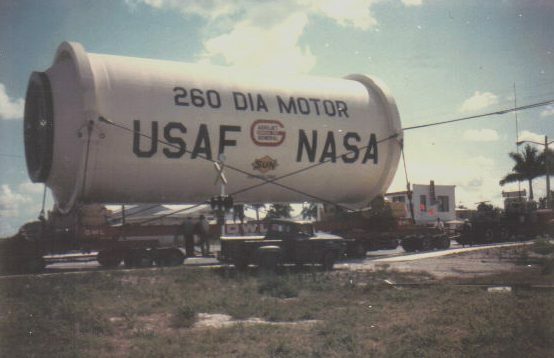 The releasable external tanks alleviated these concerns somewhat, but the design was never seriously considered by the government because both NASA and the Atomic Energy Commission were wholly focused on making NERVA the vehicle of the future. NERVA would be canceled in favor of the conventional propellant space shuttle a few years later, and though a ROMBUS-inspired design was an "alternative" concept to the winged shuttle, it was abundantly clear that the institution had preselected the winner. Phil Bono designed ROMBUS while at Douglas Aircraft in 1964. It never got off the drawing board, but its design heritage can be traced to the DC-X and Falcon 9 rockets. Unfortunately there are not very many big dumb booster designs. The Liberty Ship is one such "smart" design which uses the modern technology of the atomic age to achieve cheap access to space. 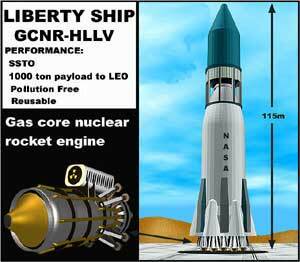 As far as I can tell, some dude on the internet proposed the Liberty Ship design in 2005, which would have been a nuclear fission powered rocket which stood 115 m tall and could carry 900 metric tons to LEO. Since even small nuclear-thermal generators are controversial on space probes, the Liberty Ship would be met with intense anti-nuclear resistance. The Liberty Ship would use a closed-cycle nuclear fission reactor, meaning that there would not be radioactive material raining down on our heads during launch. But let's not get too excited about anyone ever putting nuclear material in something as prone to mishaps as a rocket. Phil Bono of the ROMBUS design also designed Helios, a chemical first stage, nuclear second stage rocket. If ROMBUS was not happening, there is no way Helios could have possibly flown, and that's not counting the risks of carrying a radioactive payload. The AJ-260 was the largest diameter solid rocket motor ever tested. 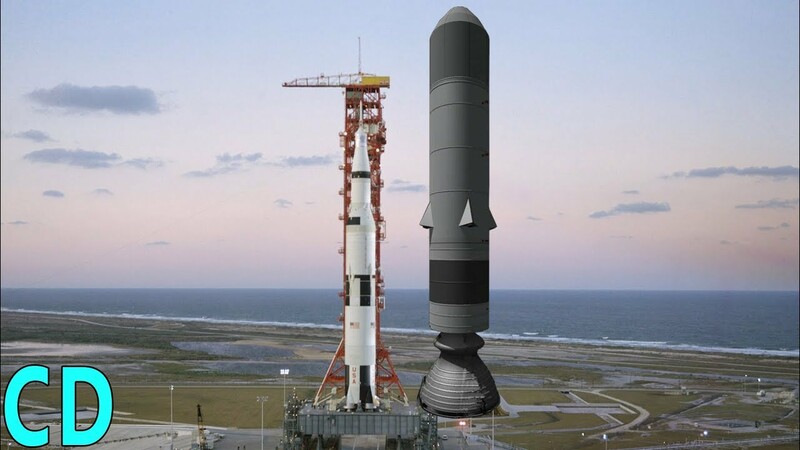 It was designed as a first stage for the Saturn IVB rocket which would lift only 27 Mg into space but at a tenth of the cost per kg as the Saturn V. In the end, the liquid boosted Saturn V won, and further development on large diameter solids was postponed again and again until eventually canceled due to the congressional mandate that solid boosters for the shuttle be transported via railway to the Cape, favoring the smaller diameter solid booster we are all very familiar with today. The AJ-260 was constructed at a ship yard much like the Sea Dragon was meant to be. The test site was accessible until a few years ago when presumably fun-hating adults placed enormous concrete slabs over the dug-out test hole. SpaceX has designed a 550 Mg to LEO launch vehicle called variously the Interplanetary Transport System (ITS) or Big "Falcon" Rocket (BFR). It uses 42 Merlin engines, which qualifies it as a big dumb booster because it uses existing technology in a big way. SpaceX is alive and kicking, and development is underway for this vehicle. There's nothing I can say here that cannot be found in much more detail on the SpaceX subreddit. If SpaceX's design doesn't fit your idea of what a big, dumb booster should look like, here's an alternative concept for what the first stage of a modern big dumb booster might look something like. We are choosing a return-to-launchsite upright landing for this rocket because it has been proven to be not only technically possible but also permissible in the current regulatory environment. Retrieving and servicing a rocket that lands in the ocean has proven to be a bad idea as with the STS solid rocket boosters. The choice of a paraffin hybrid rocket is probably the crux of this design. Hybrid rockets have not been used for heavy lift in the past because of some technical limitations involving the slower burn rate of HTPB, but recent developments using paraffin as fuel have shown a 3x higher burn rate. Check out this video of a March 2017 test burn of the peregrine sounding rocket, which uses paraffin and N2O. Paraffin is trivially easy to handle, unlike most other rocket propellants, and the combustion products are environmentally friendly. This weighs heavily into the fuel selection decision because a big dumb booster will use enormous quantities of fuel. The chosen oxidizer is not as safe as paraffin, but an N2O/O2 mixture is purported to be safer than pure N2O, which has caused fatal accidents in both the aerospace industry and whipped cream industry in recent years. N2O had previously been thought to be generally safe. Total system design can be easier with a hybrid rocket than a liquid because there is no need to match differential flow rates, design a pintle injector, or design some sort of wacky regenerative staged combustion system like the SpaceX Raptor. There are supposedly less thrust instabilities with hybrid motors than solid or liquid motors, at least with single-core hybrids (ask Mike Melville how stable he thought the four-core SpaceShipOne motor was when chunks of inter-core webbing started shooting out the nozzle). A pressure-fed oxidizer delivery system was chosen over a turbopump system for its simplicity. Proponents of turbopumps for big dumb boosters attest that turbopumps are cheapers and more reliable now than they were back in the 60's. However, I think that a turbopump could still be a weak point of a design, as seen recently with the turbopump blade cracking issue which NASA says SpaceX needs to fix before flying a crewed Dragon. Since the industry has also seen advances in the manufacturing of light-weight, high-pressure composite tanks, I thought the choice of a pressure-fed system over a turbopump was desirable for this big dumb booster concept. For the nozzle, a plug or truncated aerospike nozzle was chosen instead of a bell nozzle its comparatively small size and ease of manufacturing over a traditional bell nozzle or even more complicated variable-expansion bell nozzle. Plug nozzles are more efficient over a wider range of altitudes than bell nozzles, though bell nozzles are more efficient when tailored to a specific altitude. A plug nozzle can be easy to cool if it is designed with embedded cooling channels and manufactured by 3D printing. This annular aerospike would have just the one large combustion chamber, not 16 combustion chambers like designs for linear aerospikes for SSTO applications, so the complexity will not rise as a result. However, the choice of a plug is perhaps the weakest part of this design, and I can see it changing to a bell nozzle if any more serious study is undertaken. A blog post like this is strictly not serious (but perhaps more technically sound than some concepts released by supposedly real companies like Arca). Even if I took the time to perform this study, no sane person would believe the resulting numbers. This is my personal blog, and I'm just sitting here in my underwear eating cheetos and writing about space. To understand launch demand, the first thing to discuss is the difference between payload cost and launch cost. Payload cost is the cost to manufacture or procure the payload, but launch cost is the cost of delivering that payload to a specific place, like kg to LEO or kg to the ISS inside a Dragon or Cygnus. From this picture we can see that lowering the cost of launch will do nothing to trigger increased demand for launching large satellites like GPS Block III because launch cost is a tiny fraction of the manufacturing cost. However, material costs for kerosene, 3D-printing filament, or water are obviously much lower than launch cost. Duh. A final observation is that it is an order of magnitude more expensive to get a payload inside the ISS than it is to get that same payload anywhere else in LEO. How does that make Nanoracks' business case look? With those observations, the next step in determining launch demand is to discuss nascent space capabilities. Here's a list of stuff that might be happening soon, listed in the order in which I think they are likely to materialize. Looking at this list of upcoming capabilities in tandem with the payload and launch cost tables, I would like to propose that the source of demand for a big dumb booster will come from commercial space stations and the work people will perform in space for profit. Commercial space stations will not be profitable if they operate like the ISS, specifically due to resupply requirements which would be prohibitively expensive at current launch costs. Let me demonstrate with some real numbers from the ISS. Let's assume that the average price per kg for resupply purposes is $40,000, which is a little under the cost to put it inside the current cheapest provider, SpaceX Dragon. So don't yell at me for overestimating the cost of resupply. Next, I added up the total amount of resupply cargo sent to the ISS in 2016, including food, water, experimental equipment, parts, and everything. I took this total and divided it by 6, which is how many people are usually on the ISS at once. The average amount of supplies and equipment one person needs in order to live and work productively in space for one year turned out to be 3,700 kg. With the price per kg at $40,000 then it costs $148 million to send up everything one person needs to live and work in space for one year. $148 million per person per year just for cargo services, not launching the people themselves, and this number does not count any money spent in the NASA centers on the ground in support of the space station. That is $888 million a year for a six person space station just for cargo. Can Bigelow still turn a profit if they have to spend close to $1 billion on just supplying a six-person B330? So I can reword my prediction a little bit as follows. As soon as something that requires more human presence than the ISS gets serious funding, a big dumb booster to deliver the necessary cargo will be developed. Similarly, cheap pressurized cargo launch capability will trigger increased demand for commercial space station operations in LEO.